Used office seating is the pillar of virtually any business, as the chairs you select are what support your workers throughout the day. 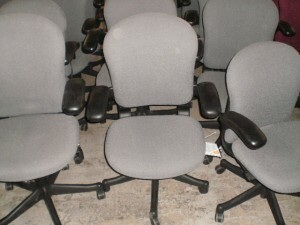 We have over seven-hundred of these used Herman Miller Reaction Office Chairs, which are an office staple. They are all in great condition, with hardly any scratches or scuff. Pneumatic seat and back height adjustments. Arms are cantilevered and height adjustable. Great for conference and training rooms! No Comments on "Used Reaction Task Chairs"